Moorfields Eye Hospital is delighted to announce two keynote speakers for its annual general meeting (AGM) which will be held on 20 July 2016. Professor Pete Coffey of the UCL Institute of Ophthalmology will present on the ground breaking London Project to Cure Blindness, which last year successfully demonstrated how stem cell technology could be used to halt visual deterioration in patients with “wet” age-related macular degeneration (AMD). Professor Coffey is one the founding members of the project which was established 10 years ago, along with Moorfields consultant Lyndon da Cruz, with the aim of curing vision loss in patients with wet AMD. Pearse Keane, a consultant ophthalmologist at Moorfields, will present on his research which hopes to reinvent the ways eye tests are currently performed in hospitals by using a new form of ocular imaging device, called binocular optical coherence tomography (OCT). The technology has the potential for eye examinations to become much quicker and more efficient. Mr Keane was recently featured in the “Power List” of The Ophthalmologist magazine; in this worldwide list, he was ranked number four of the “Top 40” ophthalmologists “Under 40”. Recently appointed chief executive, David Probert, will be leading the review and delegates will be invited to ask the trust’s board of directors questions on a range of topics. 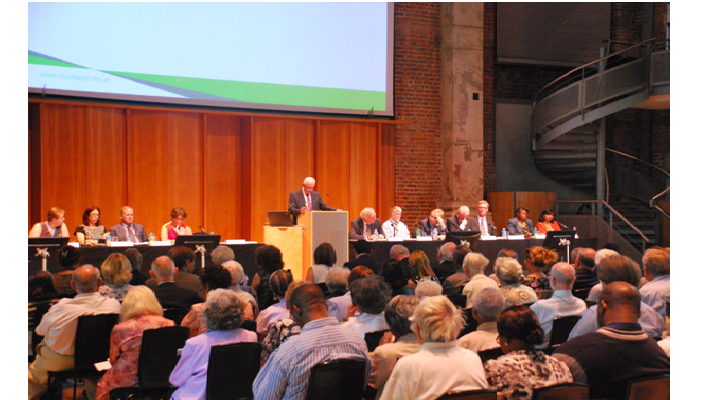 Moorfields’ AGM will take place on Wednesday 20 July 2016 from 1pm to 4.30pm at LSO St Luke’s, 161 Old Street, London EC1V 9NG. To apply for a free ticket, please complete the online booking form at http://www.moorfields.nhs.uk/membership-events or call 0207 566 2490.